The swine industry continues to experience significant losses due to PRRSV infections. The infectious dose of PRRSV has been shown to be very low, therefore highly infectious. The objective of this study was to evaluate the effect of PRRSV challenge dose in vaccinated pigs. The study was performed in ninety, three-week-old pigs from a PRRS nai?ve and PCR negative source. Groups 1 – 5 (n = 10) were vaccinated (Day 0) with Ingelvac PRRS® MLV (2 ml IM). Forty pigs served as non- vaccinated challenge controls (NVC-Groups 1–4; n=10 per group). Groups 1–4 were challenged on Day 28 intranasally with 2.0 ml of virulent PRRSV SDSU-73 at 4log, 3log, 2log or 1log10TCID50 / ml, respectively. Group 5 was not challenged. Temperature (Day 28 – 42), viremia and ADWG (Day 28–70) were evaluated and statistically analyzed. 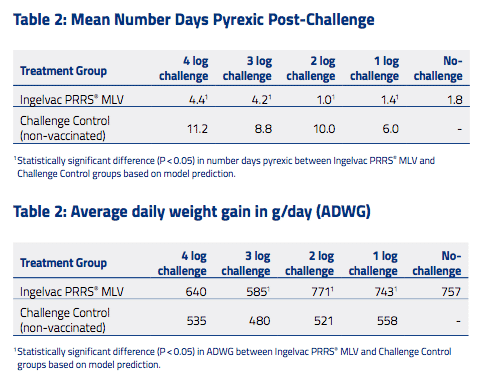 At all challenge doses, Ingelvac PRRS® MLV vaccinated pigs demonstrated a significant decrease in days pyrexic compared to NVC groups (P<0.05). At PRRSV challenge doses of ≤2logs, the average temperatures of the vaccinated challenged pigs were similar to Group 5. As compared to the NVC, there was a significant increase in ADWG (P<0.05) of vaccinates in the 3, 2 and 1log groups, and at P<0.07 in the 4log group. The ADWG of vaccinated groups challenged with ≤2logs of PRRSV was numerically similar to the ADWG of Group 5. There was a measurable negative impact on ADWG in the NVC groups with no difference across all challenge doses. 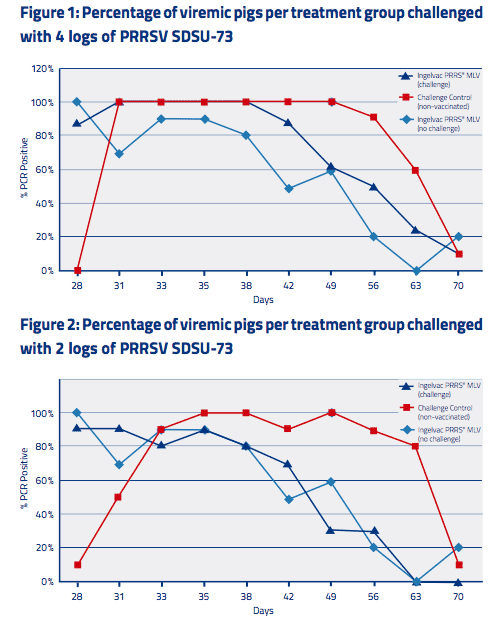 Ingelvac PRRS® MLV vaccinated pigs demonstrated fewer percent PCR positive pigs than NVC pigs at all challenge doses. As the challenge dose decreased the percentage of viremic pigs in the vaccinated groups decreased, with viremia in vaccinated pigs challenged with ≤2logs of PRRSV similar to Group 5. At all challenge doses, the NVC pigs show similar post- challenge viremia profile. In this study, at all challenge doses, Ingelvac PRRS® MLV vaccinated pigs demonstrated mitigated biological consequences of a relevant PRRSV challenge, with a reduction in post-challenge viremia, tem- perature and increased ADWG as compared to NVC pigs. For all end- points, minimal difference between 0, 1 and 2log challenge in vacci- nated animals indicates a challenge dose effect. Based on challenge dose (≤2logs), the consequences in vaccinated pigs were similar to non-challenged pigs. The post-challenge viremia and ADWG of NVC pigs were similar across all challenge doses, indicating no challenge dose effect and a measurable impact in unvaccinated pigs. Implemen- tation of vaccine along with the other components for PRRS control can mitigate the consequences of PRRSV infection subsequently im- proving health and performance.